I find you’re either into pumpkin spice everything or you’re not. There’s no real in between. But ‘tis the season for all things pumpkin (at least until Halloween) and I’m going to take full advantage of it. Plus, I had a lot of pumpkin sitting in the fridge, just screaming to be used up (those cans are massive :P). I happen to be a fan of pumpkin spice and I’ve realized that a lot of pumpkin spice goodies and treats aren’t necessarily friendly to those of us with dietary restrictions. Most are not gluten-free or dairy-free and so I decided I was going to create my own. 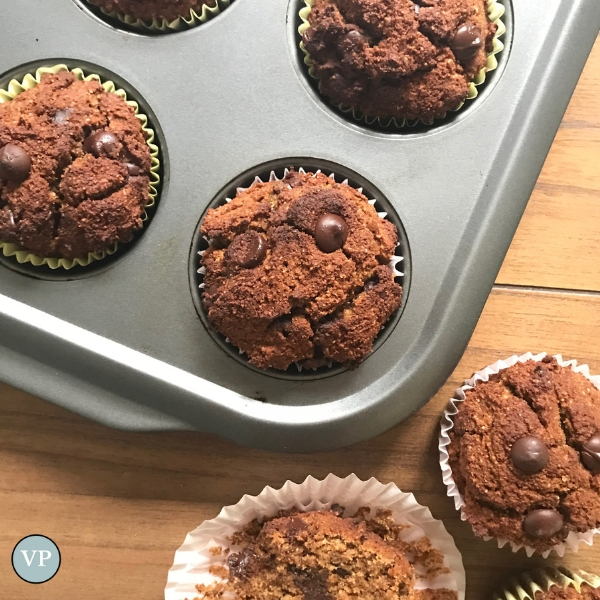 I wanted to challenge myself to create muffins that were not only gluten-free but also GRAIN-FREE. So these bad boys are just that: paleo-friendly, grain-free, dairy-free, soy-free AND the only sweetener we’re using is Lakanto - an all natural sweetener derived from monk fruit. As soon as the weather gets chilly, I find that I get cravings in the afternoon for a cup of herbal tea and something comforting like a homemade muffin or slice of pumpkin bread. So, I try to bake something up on the weekends so that we have homemade treats ready to enjoy throughout the week. It also helps us curb the impulse to buy stuff like this at the coffee shop. Preheat oven to 375F. Place muffin liners in a muffin tray and set aside. In a large mixing bowl, combine your dry ingredients: lakanto, almond flour, coconut flour, ground flax, baking soda, cinnamon, pumpkin pie spice mix and sea salt. In a small mixing bowl, combine your wet ingredients: almond butter, pumpkin pureé, beaten eggs, vanilla extract and apple sauce. Add wet ingredients to dry and stir until fully combined. Fold in dark chocolate chips. Taking 2 Tbsp of the muffin mixture at a time, fill the muffin liners 3/4 of the way up. Bake for 20-25 minutes or until a toothpick inserted into the centre comes out clean. Let the muffins cool down before serving them.